I have been working on a project called the Quality of Life Dashboard. 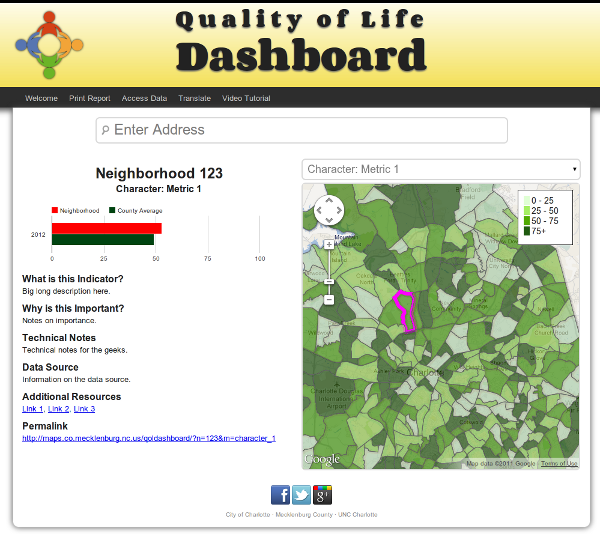 In a nutshell it’s a collaboration between the City of Charlotte, Mecklenburg County, UNCC, and a host of other partners to create a neighborhood based community dashboard showing various metrics related to community health. This is a study that was normally undertaken by the City of Charlotte and UNCC with a voluminous PDF deliverable, but this time the study area will include the entire County and we’ll be publishing the information via an interactive map-driven web site. And while normally a project that has that many participants would have me running for the hills, this one has that rarest of commodities: a really good project manager. Don't harsh - the styling is still in flux. The map interface is Google Fusion Tables driven. Besides making on-the-fly choropleth changes, this allows us to open the data directly to the public. PDF reporting via FPDF (currently a stub - not working yet). Responsive web design for the phone browser types. JSON configuration, so you can add or modify a measure in one spot. Actual data. Right now it’s all randomly generated bits. Usually when I open the code for a project, I wait until the day the project launches1. This time I decided to go ahead and release the code early in case somebody might find parts of it useful. I’m ~80 hours in, the code is in a fairly clean state (for my code), and it’s mostly done and working. I also wanted to try out Git and Github, and this seemed like a good opportunity. Plus the data won’t arrive until ~ June 2012. That’s a lot of code-sitting-around time. So, have at it - I just uploaded the code to Github. Patches and ideas are always appreciated. I’m brand new to both Git and Github, but so far so good. All command line on Linux, yo. 1 I have always thought launch is a pretentious word and should be reserved for things that actually launch, like spaceships. I guess it’s shorter than saying I took that URL that’s been publicly available for months and told people about it.